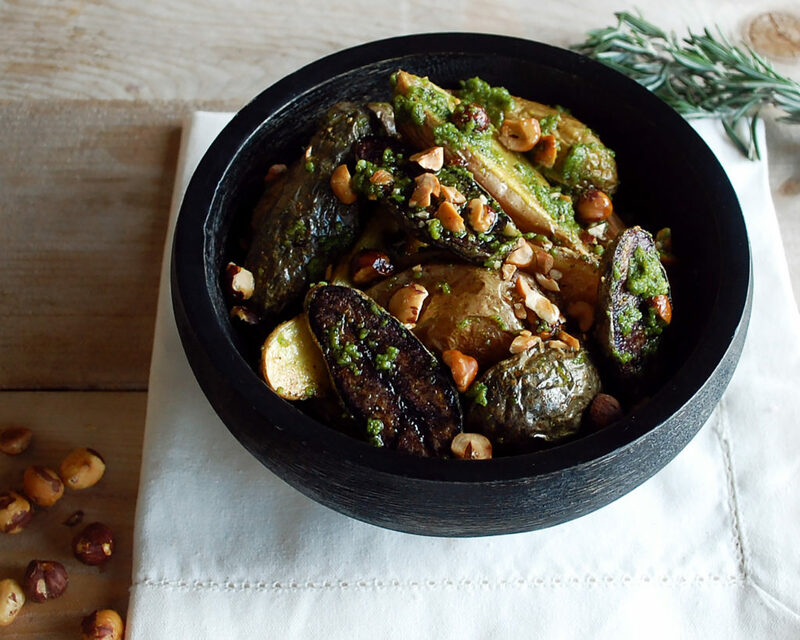 These potatoes are crisp and tender, with a beautifully fragrant, bright pesto and crunchy roasted hazelnuts on top – the perfect dish for either a simple weeknight or a weekend gathering. I roast the potatoes in the simplest of fashions. I really want all of the flavor for this dish to come from the pesto. The potatoes are more of a vehicle for the zesty, herbaceous topping. The key to good roasted potatoes is making sure they are generously coated in oil and roasting them at a high enough temperature (I usually stick with 425F). You want to make sure the potatoes are completely dry before tossing in the oil. The oil will then help to create the golden crispy edges of the potatoes as they bake. With a temperature of 425F, it will be hot enough to crisp them, but not hot enough to burn them before they are tender. The pesto is really the star of the show. Pesto is so easy to play with and come up with all sorts of new flavors so that you’re not stuck with the usual basil and pine nut combination…even though that is delicious, too. I had a bunch of rosemary laying around the house after the holidays, so I thought that’d be a nice addition. I use parsley as the base (since it would take way too much rosemary to make an entire pesto, plus it’d be completely overpowering) and then add just a tablespoon of chopped rosemary. 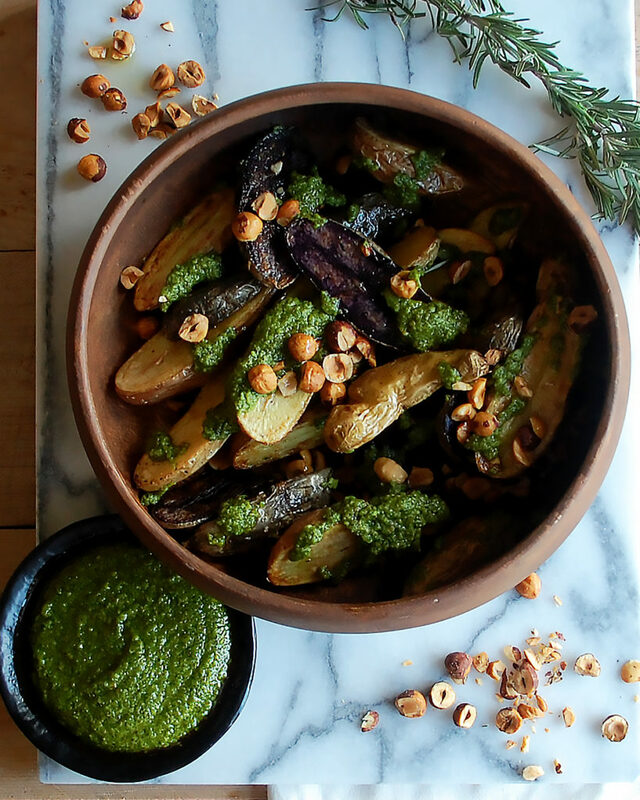 The roasted hazelnuts have lots of flavor (check out “Kayla’s Notes” at the bottom of the recipe to learn how to roast hazelnuts) and add a toasty bite to the pesto. I also use them as a garnish for some crunch on top. Other than that, the pesto is cheesy, creamy, a little acidic, and a little sweet. I could honestly eat it by the spoonful. Make sure to save any pesto you don’t use for the potatoes. It’ll last in the fridge at least a week or so. I used the rest of mine to serve with burrata and grilled bread. Enjoy! Preheat the oven to 425F. Wash and dry the potatoes. Split each in half lengthwise. Toss the potatoes in a large mixing bowl with a generous amount of olive oil, salt and black pepper. Make sure each potato is coated fully. Spread the potatoes out onto a baking sheet. Bake for about 40-45 minutes, or until the potatoes are tender and slightly crisp. In a food processor, add the parsley, roasted hazelnuts, cheese, garlic, and rosemary. Pulse until the mixture is course. Drizzle in the olive oil very slowly while the processor is on so the pesto comes together. Add the honey, lemon juice, lemon zest, and salt. Process until fully incorporated. 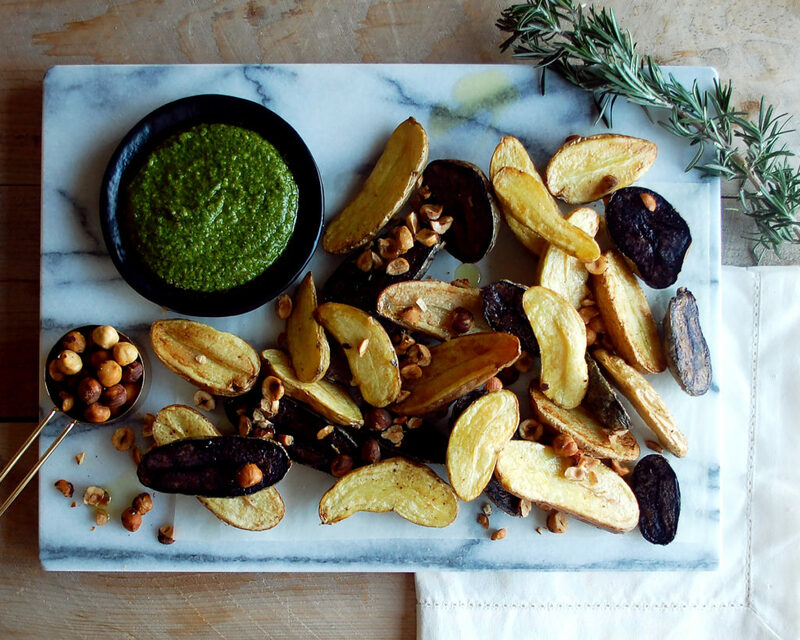 Reserve the pesto until the potatoes are done cooking. 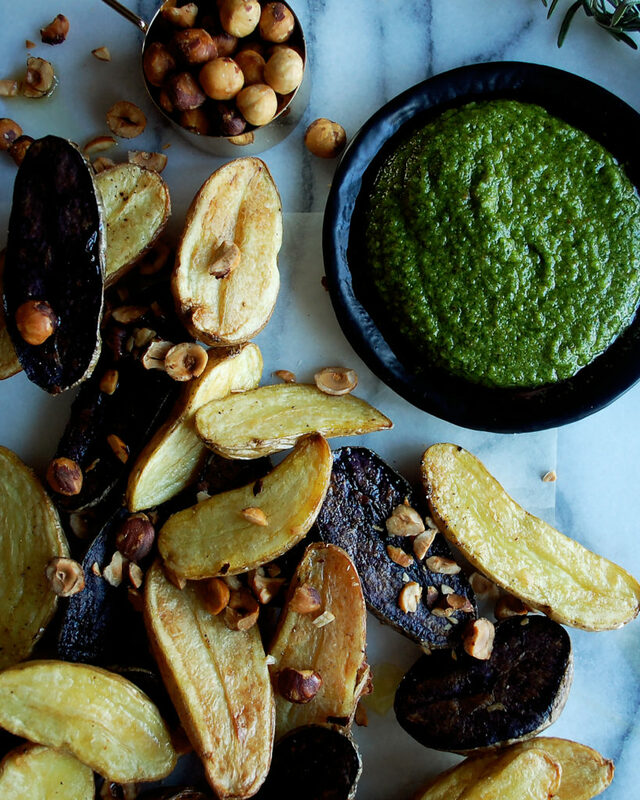 When the potatoes are still hot, toss them with the pesto. Serve them on a plate or in a bowl. 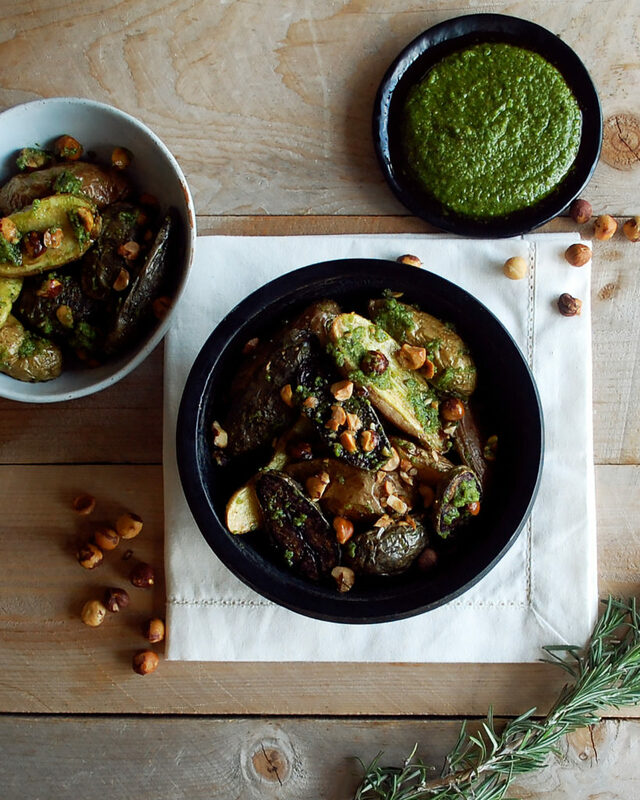 Spoon more pesto over top and garnish with the roasted hazelnuts. To roast the hazelnuts, preheat your oven to 275F. Spread the hazelnuts out onto a baking sheet and roast for about 18-20 minutes. Transfer the hazelnuts when they are warm to a dish towel. Cover them and let them sit for a few minutes. Rub the hazelnuts in the towel so that the skins will fall off. Not all of the skin will come off, and that’s ok (there are lots of nutrients in the skin). For the parsley, I started with one bunch. 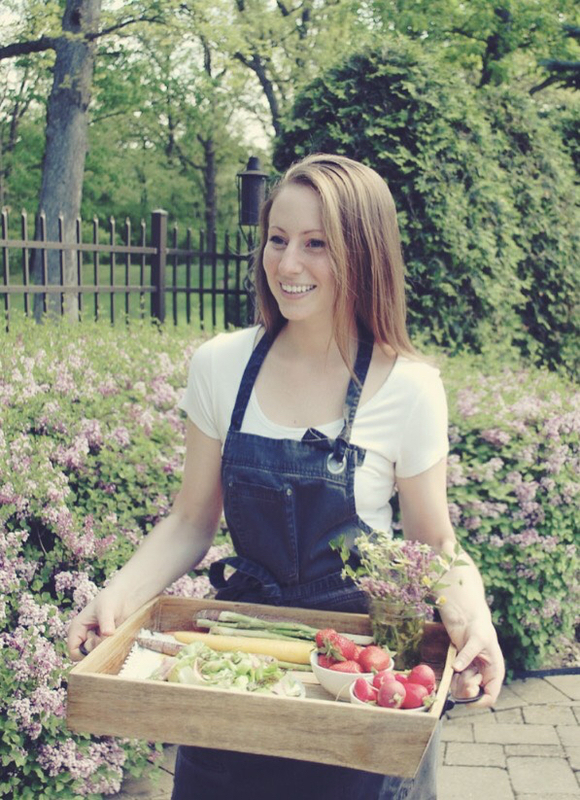 Holding it slightly raised in one hand with the leaves facing down, cut on a bias and rotate the parsley so that you end up with all of the leaves and soft stems. You don’t want the sturdy stems, but the soft ones are mild enough to blend up into the pesto (plus it saves you from picking off every leaf of parsley). Next soak the parsley in cold water to let any dirt fall to the bottom. Lastly, drain it and let it dry. In the pesto, you want to use a plain olive oil, not extra-virgin olive oil. Extra-virgin is too bitter and will overpower the other flavors. I have been exploring for a bit for any high quality articles or blog posts on this kind of area . Exploring in Yahoo I at last stumbled upon this website. Reading this info So i am happy to convey that I’ve a very good uncanny feeling I discovered just what I needed. I most certainly will make sure to do not forget this site and give it a look regularly.